Forces. (If I may strike a personal note, half way across the world and by the next dawn, which meant probably around the same time, I was born.) Nationally, it was the MEP victory of April 1956, led by SWRD Bandaranaike and amounting to what was dubbed ‘the Silent Revolution’. Following that socio-political upheaval, Sri Lanka (Ceylon at the time) would never be the same again. The UNP-CBK bloc is determined to attempt five huge experiments amounting to a total rupture and meta-transformation within the year 2016, which no other country I can think of, even ones with revolutionary administrations, has attempted either simultaneously or in rapid uninterrupted sequence. Each one of these changes would be regarded as polarizing in any society. Any pair would be considered risky. A combination or continuum of three or more would be avoided as incendiary if not suicidal. What are the five big-ticket items that form Agenda 2016? Firstly, the new Constitution which will dislodge the unifying power centre that is the nationally elected executive presidency while de-constructing the country’s unitary state framework and reassembling Sri Lanka as a mere collage of self-governing provinces. Secondly, the initiation of extraordinary measures such as introduction of special laws, setting up special courts and a special prosecutors’ office and inducting foreign forensic experts to prosecute a popular military and political high command of a large military which won a thirty years war against secessionist terrorism. Thirdly, the initiation of an underwater tunnel and road and rail bridge which will eliminate after millennia, the protective natural barrier, the narrow sea wall that keeps Sri Lanka separate, independent and distinct from the Indian behemoth and its billion people, and what is more, will bridge this country’s Tamil majority North and Tamil Nadu. If anyone should be whipped with a stingray’s tail for posing danger to our culture and traditions, it is the one who agreed to close Nature’s protective gap with India which enabled us to evolve and preserve a distinct, independent, demographic, cultural and religious identity. Fourthly, the ECTA which is to be signed in February, the economic pact with India, which will “liberalise” Sri Lanka’s labour market in the IT sector and the ship/boat building sector, going by the recent joint communique issued after the meetings of the Secretaries of the Commerce Ministries of India and Sri Lanka. Thus Sri Lanka’s IT sector will be swamped by graduates from India’s IT universities and colleges. Fifthly, the adoption of market fundamentalism and deep and extensive privatization as Government policy, as symbolized by the forthcoming appointment (if one is to go by mass media reports) of Prof. Razeen Sally as Secretary to the Treasury. In an essay in the Daily FT Prof Sally charged Mahinda Rajapaksa with “ caveman economics” and with no trace of irony suggested as a model of economic policy and management for Sri Lanka, that of Chile in 1973-’74. Those were the years in which Gen. Augusto Pinochet bloodily overthrew the democratic soft-left regime of President Salvador Allende and inducted US economists led by Milton Friedman from the Chicago School, to erect a model which laid waste to Chile’s social welfare system and imposed ruthless free market fundamentalism. So the elected Rajapaksa was a “caveman” while the neo-fascist dictator Pinochet was not! Prof Sally is an adherent of Friedrich Hayek and a member of the Mont Pelerin society, a freemasonry of ultra-rightwing, anti-state, neoliberal economists. The PM’s Austrian federalism and Prof Sally’s Chilean privatization will fuse and ignite. The Sri Lankan model of a strong State which combines the centripetal unitary system, the directly elected executive presidency, multi-party electoral democracy, devolution of power to the provinces, a large state sector and social welfare, has proven a conspicuous success in prevailing over suicide bombing and mid-intensity war, two ultra-left xenophobic uprisings, a military coup conspiracy, cross-border terrorism based in an ethnic kin-state, and an interlude of a foreign intervention and peacekeeping troop presence. The Sri Lankan system succeeded in protecting and preserving independence, sovereignty, territorial integrity, multi-party democracy and a market economy. It not only enabled victory in war but also a rapid postwar reconstruction and a fast-growing postwar economy. Why attempt to dismantle rather than gradually reform it? (b) The character of the political power play today is multi-polar: Ranil, President Sirisena, Mahinda Rajapaksa and the TNA. 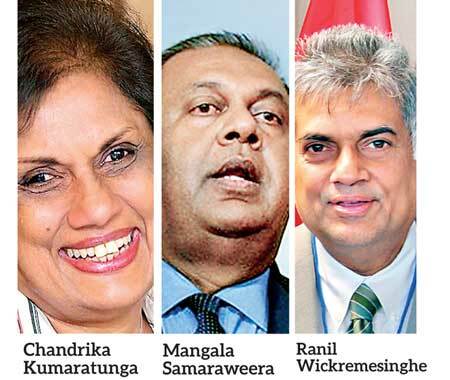 The main arena is tri-polar: Ranil, Maithri and Mahinda. The three poles are not static but tend to form ephemeral patterns --a fluidity that my father Mervyn de Silva used to call ‘kaleidoscopic’. This is confirmed by the pragmatic interview President Sirisena has just given The Hindu (Jan. 3rd). (c) The atmosphere has been vitiated by a witch-hunt via the FCID and the Special Commission on Bribery. Any serious reform needs dialogue and broad consensus, but that is exactly the opposite of the dynamics generated by the witch-hunt. Ideologically we now have the most rightwing pro-Western government we have had since 1952-1956, which triggered the Bandaranaike–DA Rajapaksa breakaway, the founding of the SLFP and the MEP victory of 1956. Having found our way as a nation to a truly historic zenith in 2009 under Mahinda, we have lost our way since (Just as we had before Mahinda arrived at the presidency in 2005), because we have strayed too far from the social democratic Middle Path in one direction or another. Postwar, we needed reformist change, but not just any change. We needed to evolve beyond the hyper-securitised developmentalist model to a more liberal progressive agenda while consolidating the historic victories this nation achieved under MR’s leadership. Instead we have returned to an obsolescent pre-MR agenda, piloted by pre-MR leaders, who failed the greatest test history set us for centuries. Their agenda targets, subverts and aims to dismantle our hard-won victories. That isn’t progress, it is rollback and retrogression. Society needed a measure of ‘Glasnost’ i.e. openness, but we are going too far in an entirely wrong direction with ‘Perestroika’ i.e. restructuring, as reform metastasizes into anarchic, nihilistic trashing of the state and its successful achievements, risking an uncontrollable chain reaction culminating in chaos. If we have taken a welcome step forward in terms of a less uptight, more relaxed social atmosphere, we have taken a ‘Great Leap Backward’ in terms of stability and the national interest.